2. Color: Golden, other available colors are pink, green, red, blue and purple. 3. The sheet is made of 2mm, 3mm and 4mm gem stone. 5. 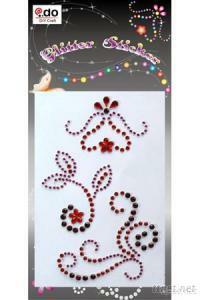 This sticker is greatly used for the decoration on the many crafts, card-making, scrapbook, gift packing and etc. 6. Transferring sheet needed to help transferring the sticker at a perfect state.